AUTOMOTIVE NEWS: How much growth does Subaru want? DOLL: We're not trying to grow 10 percent a year or 8 percent a year or something like that. We're just trying to incrementally get a 3 to 5 percent rate per year. And we think that's doable, based on the sales we're currently enjoying, the future products that are coming and also the loyalty of our customers. That will help us. Subaru of America is celebrating its 50th year in the U.S. in 2018 as its sales rise to record levels, driven by a lineup dominated by all-wheel-drive crossovers. The company this year has opened a new U.S. headquarters in Camden, N.J., and is launching the Ascent three-row crossover, filling a glaring product hole. Subaru's U.S. sales have advanced 3.2 percent this year through April, and the automaker remains on pace to post its 10th consecutive year of record U.S. sales, despite a cooling market in general. 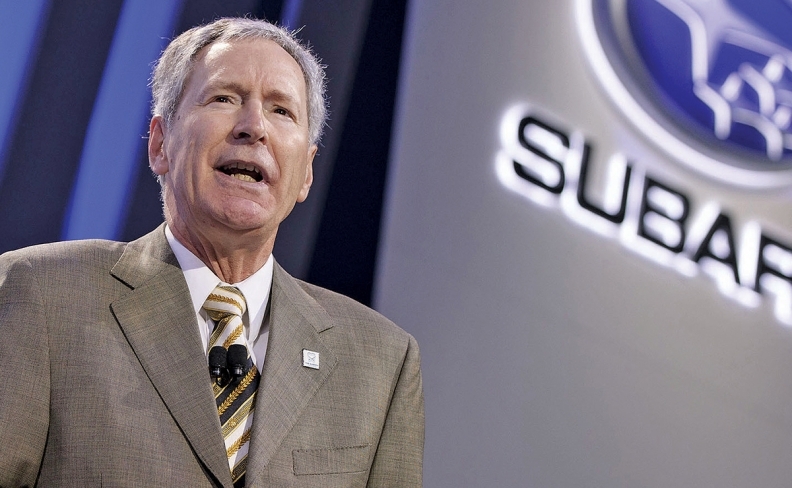 Tom Doll, 63, a onetime accountant who has been the architect of much of Subaru's U.S. growth in recent years, was promoted to CEO in March. He spoke this month with Staff Reporter Jack Walsworth. Q: What does the promotion to CEO mean to you? A: I was very honored to receive the recognition because in Japanese culture, it says a lot about the trust that they have in the U.S. management that's running their most significant subsidiary. When they told me, I was surprised. I just assumed that they would always want to try to keep for themselves. But I think it goes to the level of trust that we've developed over the years. What that means now is that I go directly to Mr. (Tomomi) Nakamura, the president of Subaru Corp. in Japan, with no intermediaries. In the past, I would have reported to Nakamura-san, who was previously CEO here at Subaru of America, and then Nakamura-san would have reported back to Japan. Now I have that direct ear. It continues to make our business strong because now I'm communicating directly. What is the outlook for Subaru of America for the rest of the year? Our stated goal for this year is 680,000 vehicles. We have two big models that are coming out for us. We've got the Ascent, which will start to be sold probably around late June-early July. We're expecting the Ascent to help round out our product line with Outback, Forester and Crosstrek doing so well. We think the Ascent in that three-row SUV segment is going to do very well for us. Later in the year, we have the Forester coming, in the October-November time frame. Probably more like November, based on the shipping that I'm seeing. What is the outlook for the market in general? The market is tough. It has settled in at this 17.1 million unit range. Interest rates are increasing and that's having an effect on the psychology of people. Mortgage interest rates are higher, manufacturers are starting to move away from zero-percent financing and all this subvention that they had to put in because the cost is just too great. Everybody got used to low interest rates. It's going to be interesting to see what happens and if the Federal Reserve continues to raise rates. They indicated that they were in a wait-and-see mode. But they later came out and said they might still raise interest rates in June. How are rising interest rates affecting Subaru? So far we're OK. But the whole market is more competitive. It's just one of those things. You have to deal with it. Everybody has the same issue. How has consumer interest been in the Ascent? Have retailers received significant preorders? From our retailers' perspective and even from a customer perspective, the Ascent is probably the most anticipated launch since the original Outback in 1995 or 1996. It brings access to the family segment that we never really were able to sell into before in an effective way. The reaction has been tremendous. We already have, without any advertising, 4,200 sold orders. That's the most sold orders we've ever had for a product at this point, prior to its official launch. With the Ascent arriving, is Subaru's lineup complete? For the short run, the lineup's in pretty good shape. Now we've got products for all of the segments our customers are looking for. That's not to say we're done. There are other things we're considering and working with Subaru Corp. on. But right now, we're just excited the Ascent is coming and we're making sure that when Forester comes out later this year, we get that off to a good start. We will focus on managing the transition from the 2018 model year Forester to the 2019 Forester. The factory inspection scandal that hit Subaru last year in Japan caused trouble with customers there. How did it affect Subaru in the U.S.? We haven't had much impact, if any. It doesn't affect the U.S. market. They were inspections that were done at Subaru Corp., and the inspections that are done for the U.S. market are completely different. It's the same thing for the fuel-economy [data tampering] issue that they have over there. That had no effect on our market whatsoever because we go through EPA and [the California Air Resources Board] in the United States. We have no issues at all with fuel economy. Impreza sales are down this year through April. How concerned is Subaru after the car's strong sales right after its redesign? We don't like any of our sales to go down, obviously. But the Impreza sedan is in a tough segment. People seem to be moving out of sedans into smaller sport-utility vehicles. That's really a market change. The question for us becomes: What do you do to try to counteract that? Do you try to steal share to maintain your sales levels by using massive incentives that hurt your brand? We've determined that that's not what we want to do. We would rather have it find its natural level at the incentives that we're willing to put into the market. Fortunately, we have other vehicle lines that we can move that production capacity to. It's a segment issue and a market issue. We can't afford to push it because it would be too costly for us to be able to do something like that. Is it the same case for the Legacy? Yes, same thing with Legacy. We're not abandoning these segments, for sure. We still sell some nice volume in that segment, but given the change in the market dynamics, moving from sedans into these smaller SUVs and midsize SUVs, it's a market trend. If we try to incentivize our way out of it, for us in the long run, that's not going to be good. How much growth is left for Subaru in the U.S.? As we get into next year, the life cycle of our products will still be very young. They were aging, but now we're getting younger in terms of the product and with the styling that we have. With the demand levels we have, we think we can hit our midrange sales targets and this year's target of 680,000, and then incremental growth beyond that. How important is the monthly sales streak to Subaru? The sales records are a byproduct of doing everything right. If the records continue, that's great. But we're not so much focused on monthly records as we are trying to make sure, for the year, we get an increase. If it just so happens that we are able to continue these monthly year-over-year sales increases, that's terrific, but that's not our driving motivation. Will Subaru discontinue monthly reporting, as General Motors has? I think this may be why GM decided they didn't want to report monthly anymore — because things do happen. And having to explain what happened, unless you're in the market, becomes a distraction. I don't think we're going to do it, but I can understand why they did. Jay Shoji was brought back to Subaru of America from Subaru Corp. when you were promoted. What's his role? Jay is the executive vice president. He reports into me. Jay will be handling essentially all of the liaison functions. We have liaison staff in all of the departments that report through Jay back to Subaru Corp. Jay's responsibility is to make sure the levels of communication are effective — not just at the top of the organization, but throughout the organization.